A pretty big hit for the horror genre, 2013’s The Conjuring will produce a sequel, but apparently it won’t hit screens until 2016. In the meantime, the series’ producers bring us 2014’s Annabelle, a prequel to The Conjuring. Set in 1969, we head to southern California to meet young married couple John (Ward Horton) and Mia Form (Annabelle Wallis). A residency-bound med student, John displays a bit of insensitivity toward Mia and her situation, so he tries to make it up to her with a present: an antique doll to add to her beloved collection. Literally immediately, their lives take a turn for the worse when a crazed cult murder occurs across the street – and comes into the Gordon home, where Mia gets stabbed in the stomach. Thankfully, she doesn’t lose the baby, but she gets put on bed-rest for the remainder of her pregnancy. That doesn’t work out well. During the assault, the new doll gets infused with a demonic spirit, so more bad events pile up in the home. We follow their attempts to deal with all of this bad juju. One thing one shouldn’t expect from Annabelle: an original, creative horror tale. The film clearly wears a lot of influences on its collective sleeve, with a particular nod toward 1968’s Rosemary’s Baby. Heck, the movie’s creators even wink at this, as it’s no coincidence that our lead characters sport the same first names as Baby’s main actors Mia Farrow and John Cassavetes. This means we find a lot of scenes that seem to have been cobbled together from bits and pieces of other movies. A lot of Annabelle comes with a “been there, done that” vibe, as I find it hard to spotlight anything original about it. That said, Annabelle delivers something sorely lacking in much modern horror: a creepy atmosphere that set me on edge. I often feel bored by movies like this, as they do little more than waddle along without much purpose beyond the occasional scare moment. While the story of Annabelle seems underdeveloped and thin, I can’t ignore the unsettling tone it creates. This unsettling feeling makes the tale more involving and effective, especially because the movie doesn’t rely much on those aforementioned “boo sequences”. Oh, we get a few of those cheap jolts, but not a bunch, so they don’t interfere with the effort much. All of this leaves Annabelle as a mixed bag, but one I think seems more satisfying than not. Maybe too many bad horror flicks have lowered my expectations too much, but a movie that sets my nerves on edge and avoids easy scares has to count for something in this day and age. Annabelle brings us just enough to be mildly memorable. Annabelle appears in an aspect ratio of approximately 2.40:1 on this Blu-ray Disc. The movie boasted a generally positive presentation. For the most part, sharpness seemed good. A smidgen of softness cropped up on occasion, but not to a notable degree. Overall clarity remained solid, and the image lacked problems like jaggies, shimmering and haloes. No print flaws marred the presentation. Like virtually all modern horror flicks, Annabelle went with a stylized palette. We got a chilly teal feel combined with some yellowish tones, so don’t expect anything dynamic. That said, these suited the movie. Blacks were reasonably dark and dense, and shadows were acceptable. Nothing here dazzled but the image seemed perfectly satisfactory. As for the film’s DTS-HD MA 5.1 audio, it offered a fairly typical horror movie soundscape. This meant a lot of creepy atmosphere and occasional “jolt moments”. Along with good stereo music, the soundfield was able to open things up in a satisfying manner that embellished the story; the mix didn’t impress, but it worked fine. As we shift to extras, we find four featurettes. 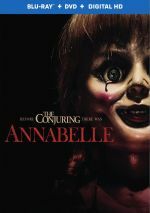 The Curse of Annabelle occupies five minutes, 31 seconds with notes from producers James Wan and Peter Safran, stuntperson Tree O’Toole, writer Gary Dauberman, and actors Ward Horton, Tony Amendola and Annabelle Wallis. We learn of the source story and its adaptation for the screen as well as creepy events during the shoot. This offers a superficial promo piece. During the five-minute, 32-second Bloody Tears of Possession, we hear from Horton, O’Toole, Dauberman, Wan, Safran, Wallis, director John R. Leonetti and actor Alfre Woodard. “Tears” examines a murder scene in the film and Leonetti’s approach to it. While we get a few decent notes here, the show remains pretty forgettable. Dolls of the Demon goes for four minutes, four seconds and includes Wallis, Wan, Horton, Amendola, Safran, Woodard, and set decorator Kris Fuller. This piece tells us a little about the Annabelle dolls used in the movie. Like “Tears”, “Dolls” includes a couple of good comments but it seems too promotional to be terribly worthwhile. Lastly, we get A Demonic Process. In the four-minute, 59-second reel, we locate comments from Leonetti, Safran, Wan, Wallis, Horton, KNB EFX Group supervisor Mike McCarty, composer/actor Joe Pishara and sculptor Norman Cabrera. Here we learn of the design and execution of a demon character in the film. It’s another largely insubstantial reel. Eight Deleted Scenes take up a total of 20 minutes, 35 seconds. The most significant addition comes from the use of a creepy building superintendent character, as he gets ample time here. Otherwise the extra footage tends toward a few more general scare moments and not much else. We find enough of those in the final cut, so these other sequences wouldn’t have added anything to the movie. The disc opens with ads for The Hobbit: The Battle of the Five Armies and Inherent Vice. No trailer for Annabelle appears here. A second disc provides a DVD copy of Annabelle. It includes the “Curse” featurette but lacks all the other extras. Although Annabelle wears its influences on its sleeve, it manages a decent horror experience. In particular, it boasts a consistently creepy atmosphere, and that helps it overcome some of its flaws. The Blu-ray comes with generally good picture and audio as well as a minor array of supplements. Annabelle does enough right to become a moderately involving film.